I don’t consider myself a picky eater. I do however have motivation problems when it comes to fruits and vegetables, or anything that isn’t a cookie or a big box of Nerds. It’s not that I don’t like apples or zucchini, it’s just that when I’m starving they sound wholly unappetizing, especially in their raw or common form: carrot sticks with your choice of dip, a baked potato… so boring, so plain. It’s not that I need it deep fried to find it palatable, I just need it to be a little more interesting. And so, the following are two recipes and a few ideas that do just that. I like to make this soup when the carrots in my crisper are nearing their expiration date but baby carrots (just chop in half, no peeling necessary) or the sweetest, freshest carrots you can find would be even better. The bitterness of old carrots can cut right through, despite the nose running ingredients that I liberally add. 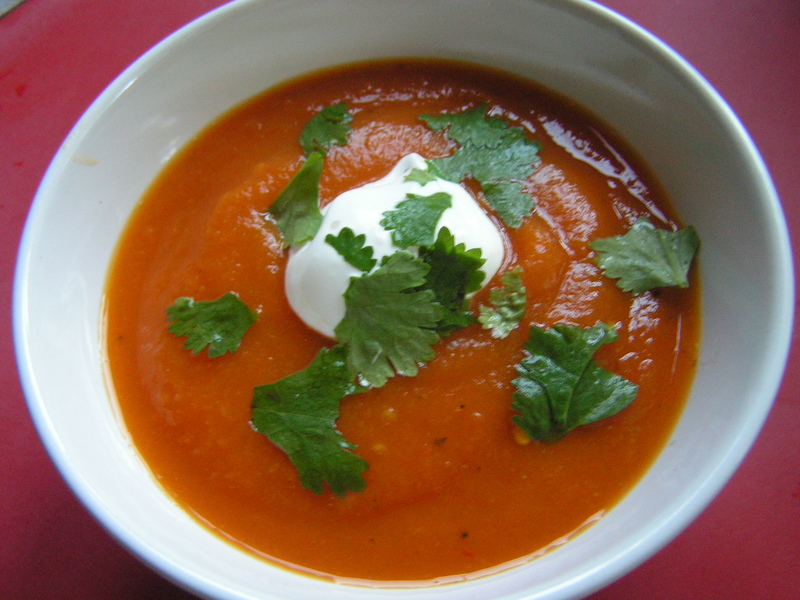 Also, spoon a dollop of sour cream on top of your bowl of soup to round out the flavors. This Shape magazine recipe omits fat but I think it’s important to add some creamy dairy goodness to make the soup a touch more satisfying. In a large (5-quart) saucepan, combine all ingredients except cilantro. Bring the mixture to a boil, then reduce the heat to low and simmer for 30 minutes or until the carrots are tender. Transfer the mixture to a food processor in batches, 2-3 cups at a time. Purée until smooth. Return the puree to the saucepan and reheat. Stir in chopped cilantro. Serve promptly. Sometimes just changing the texture of a vegetable can go a long way in making it more appetizing. Instead of crunching through a giant carrot or trying to get your teeth into a raw beet try shredding them. I first tried a shredded carrot salad at Russian Tea Time, a Russian restaurant in Chicago decorated in ruby velvet. It’s the sort of place you would take your Russian mistress for a very late night dinner and a vodka flight. It was pretty cool and the food was excellent. Their carrot salad was sort of the side dish equivalent of rice and beans at a Mexican restaurant but I was impressed and when I got home I began to look for recipes to replicate the dressing. Here’s one I really enjoyed: Belarussian Carrot Salad, I think the coriander makes the dish. 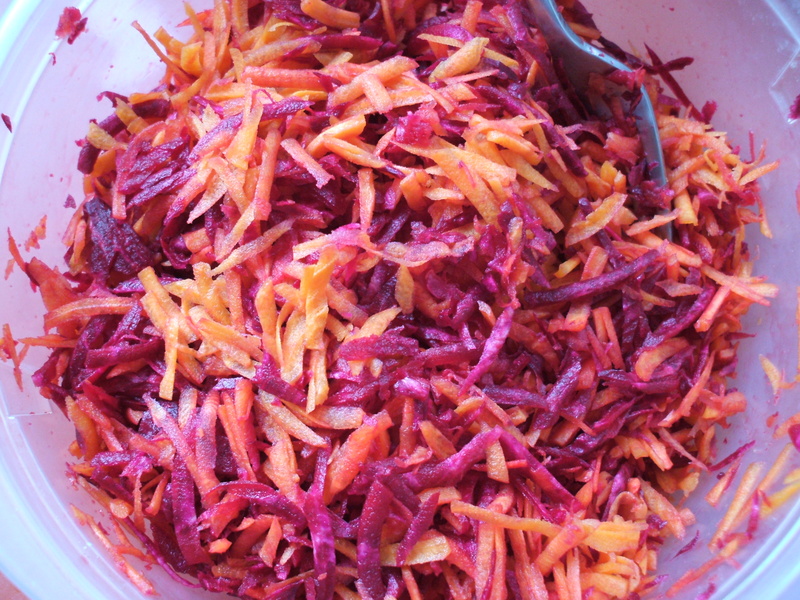 But I have a picture of carrots and beets you say, well, the beauty of a salad like this is you can throw in whatever you want like shredded beets or even avocado. Give it a try.